Emo Court in County Laois is truly one of Ireland’s best kept secrets. Clichéd perhaps, but it is the only other building in Ireland to be designed by James Gandon, who designed the Customs House, outside of Dublin, that could well have been lost forever. A truly magnificent edifice, it has had a mixed up but terribly fortuitous history with thankfully a happy ending. 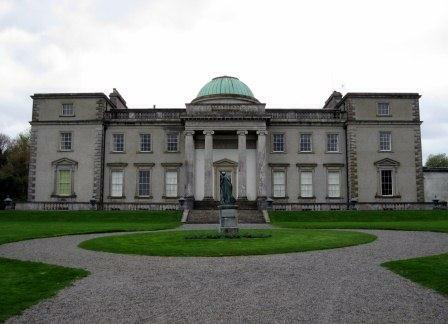 Commissioned by the Earls of Portarlington in 1769, it took some 84 years to complete depending on the incumbent Earl’s (there were seven in all) wealth at the time. They were popular landlords who laid out magnificent grounds with an ornamental lake in the midst of 1000s of acres of indigenous oak and beech woods that they were quite happy for the local people to use even back then. A rich legacy, even without the fine house, that has matured into the fine recreational space it is today and will be for generations to come. This magnificent house, seemingly in the middle of nowhere, is well worth going to see especially if you have an interest in architecture. The most stunning feature apart from the impressive neo-classical façade is perhaps the rotunda which ‘rises like a fountain’ with marble columns, gold stucco and an inlaid floor. The wonder is that it survived at all? as the house, having been abandoned by the Earls of Portarlington in the 1920’s, was then bought by the Jesuits who set about some potentially catastrophic changes to the structure? Including cutting out half of the rotunda to make a church, taking up an inlaid floor and removing fireplaces and marble columns, which fortunately they stored downstairs in the basement of Emo Court. So, that when the house main was bought by its major benefactor Major Chomley-Harrison in1969 he was able to piece it together like a jigsaw over the next 20 years eventually bequeathing the house and the entire estate to the nation in 1994, on condition that he be allowed live out his life at Emo Court. Fondly remembered by the locals for his time there, he died just two months short of his 100th birthday in 2008 and as you walk around the house it’s like he just stepped out for a minute, with postcards on the mantelpiece, family photographs and the drinks tray set in the drawing-room. And while one may wonder in awe at the house and its eclectic collection of priceless art and furniture it dawns once more that perhaps its the kindness of strangers to these shores that really counts in the end? 1 Visit the Church designed by the same architect James Gandon, turn right just outside the main gates. 2 Visit or stay in the 5 star Heritage Golf and Spa Hotel next door good value 3 for the price of 2 night deals midweek including dinner. 3 The Rock of Dunamase known as Ireland’s acropolis, another former seat of the High Kings of Ireland that has yet to be excavated fully, great views from the summit. 4 Morrisey’s Pub Abbeyleix caught in a timewarp it has to be seen to be believed, snugs, pot bellied stove and creamy pints with atmosphere. 5 The Gallic Kitchen well priced homemade Irish food with a french twist, great lunch stop. 6 Durrow Castle is a very nice place to stay in the Midlands, very popular wedding venue with beautiful interiors and grounds. 7 Heywood Gardens Ballinakill, one of only 4 gardens designed in Ireland by Sir Edwin Lutyens and Gertrude Jekyll. 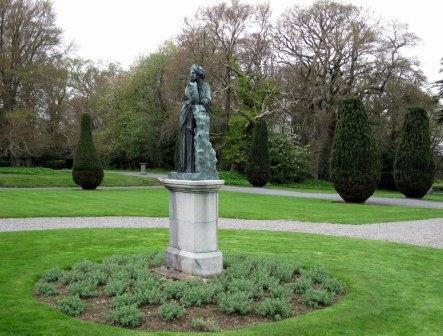 8 Irish National Stud and Japanese Gardens only about 30 minutes up the motorway in the direct of Dublin. You could easily spend a whole day here seeing where the most famous Irihs racehorse were born and bred. 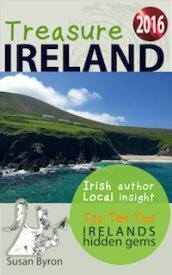 9 Kildare named after Cill Dara the church of the oak, which was believed to have been sacred to the Goddess Brigid who later became the second patron saint of Ireland. 10 St Brigid’s Holy Well Tully dates back to pagan times when she was the Goddess of Spring, the land, animals and fertility. Her feastday the 1st of February is still considered the first day of Spring in Ireland.